Several of the sectors we are invested in are extremely weather dependent. The fortunes of the firms in these sectors will hinge to some extent on weather conditions 3-6 months in the future. Firms operating in the agriculture sector are the obvious ones that will be impacted by weather conditions. Less obvious is the impact weather has on the natural gas sector. Much of the new electrical generation capacity that has been added to the grid in the U.S. in the last decade is natural gas powered. Due to environmental and cost concerns such plants were preferred over coal or nuclear installations. In the summer air conditioning loads put a strain on generating capacity. Natural gas ‘peaker generating plants' are put online to supply the incremental electrical capacity to meet demand. Long term weather forecasting has been aided recently by the use of supercomputers, as well as quantitative models that have been fine-tuned over the years. One model was recently featured in an article in Der Spiegel. It uses a supercomputer located in the U.K. to digest millions of pieces of observation data. They then run forty-one simultaneous simulations using input data that varies slightly. Over time the results from the forty-one models begin to vary – sometimes significantly. But at some point the models point to a general consensus, especially when some of the outlier results are excluded. Using statistical measures of the variance of the results, and the consensus conclusions, the model has been quite accurate – a major improvement in mid-term weather forecasting. 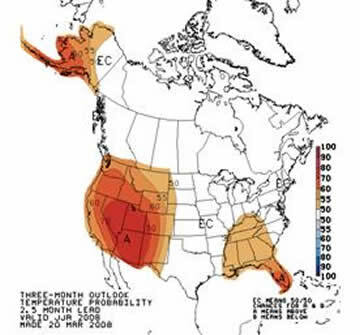 Running the latest data in the U.K. supercomputer, the model is now forecasting a hot summer for Western North America (see map). If so, this has bullish implications for the natural gas market. Since extreme heat and drought conditions tend to have a high degree of correlation historically, the heat also has implications for the grain harvests in the U.S. Abnormal heat in the Gulf Coast and Florida areas can also add energy to tropical storms formed during the ‘hurricane season' which begins July 1 st . The National Weather Service (NWS) also has a mid-term model that forecasts conditions several months out. Data from that model, and the model design is entirely separate from the U.K. supercomputer model. The National Weather Service model also forecasts hot and dry conditions this summer. The model outputs for the June, July and August months (periods when air conditioning loads will generally be at their peak) are set out below. The NWS chart on the left is the temperature forecast. 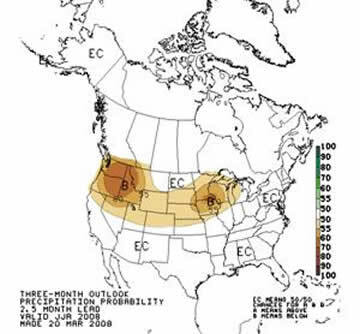 Based on the last 30 years of data the models expect an above average probability that temperatures in the Western and Southeastern U.S. will be above normal (as delineated by the ‘A' meaning above average and the brown coloration).. The chart on the right is the forecasted precipitation levels. Compared to data in the last 30 years it is expected that we will see below-average rainfall across a band in the Northern U.S. (as delineated by the ‘B' and brown coloration) – including across the corn and wheat growing states of Colorado, Nebraska, South Dakota, Iowa, and Wisconsin. 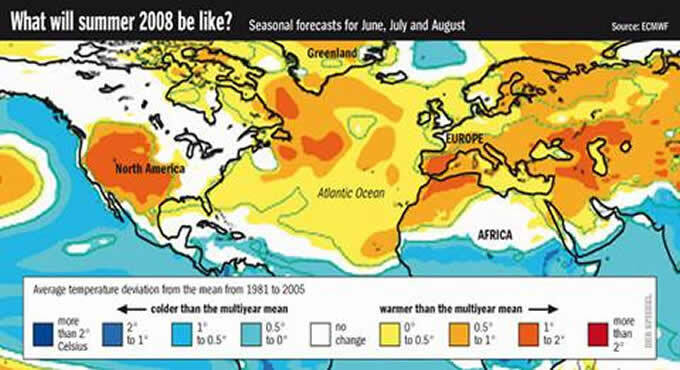 While by definition all models are not entirely accurate, the statistical methods they utilize indicate that (1) we have an above average chance of a hot summer in North America, with (2) a potential of below average rainfall in important agricultural areas. Both conditions would be bullish for our energy and agricultural heavy portfolio.